In his latest book, biographer Blake Bailey has turned his attention to his own life and the lives of his family with memoir, The Splendid Things We Planned (February 2014). 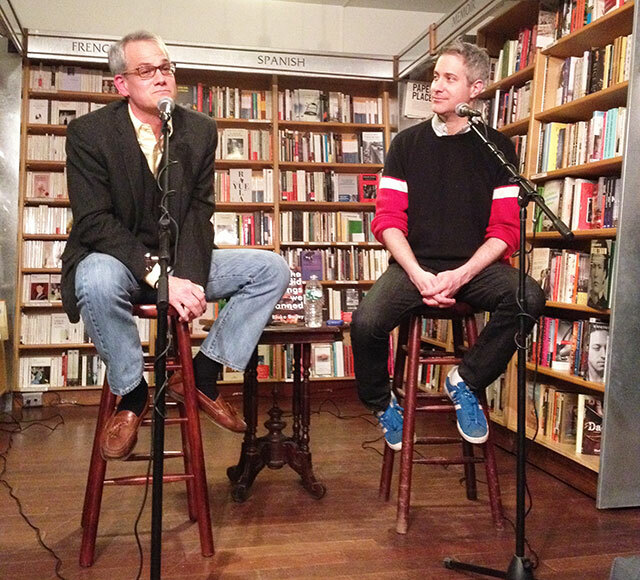 McNally Jackson hosted Bailey for a reading along with Darin Strauss for a conversation. Bailey has chronicled the lives of Richard Yates and John Cheever and currently is working on a biography of Philip Roth. But for the last eleven years he has also been writing his own story and his brother’s battle with addiction. He reads from a section of the book set in 1983. His brother, Scott, has tickets to a Cheap Trick concert. Instead, his brother drives around on a motorcycle, drunk. Darin Strauss begins the conversation by asking Bailey about how he felt about his portrayals of the people in the memoir. Strauss has also authored a memoir, Half A Life (2010) examining the moment in high school where a bicyclist swerved into the car Strauss had been driving. He killed her. Sometimes its embarrassing and hurtful, he adds. He felt he was sympathetic to the portrayal of his father, and, his mother, he says took some hard knocks in the narrative, but felt it was all accurate. Bailey asks Strauss if there had been any repercussions to his memoir, first published by McSweeney’s and then later in paperback by Random House. Since the memoir was originally published with a smaller press, Strauss thinks he might have endured less legal vetting than a major publisher like Random House would have put him through. The memoir might be more frank as a result. But mostly, after publishing the memoir, people who knew the girl killed by the car pointed to things that indicated she had been planning it for some time. For Strauss, his memoir seems to have helped him answer some of the questions surrounding the death of the bicyclist. He asks Bailey how he knew he wanted to tell the story of his brother. Writing biography begins with collection facts, Bailey explains, and then letting the chips lay where they may. In the early stages of his memoir, he took the same approach. He gathered the facts, the memories, and laid them out chronologically. But the story was boring. “I was reluctant to drag myself into it,” he says of the memoir. But without his personality, the story was lacking a fundamental element. Ultimately writing the novel revealed sympathies for his brother that he believed he had lost. He recalled moments where he would laugh at something and know only his brother could also find that thing funny. They had been close, and in the final years of his addictions, the goodness had been forgotten. The main difference Bailey found in writing the memoir from writing a biography was in that with biographies, he begins by gathering the facts, and only then forms a kind of thesis. He says that the biography of Roth that he is working on might take eight or nine years–he stops himself, says his editor is in the room, and adjust the timeline downward to five years–and only after completing the research does he determine an accurate narrative. He also criticizes biographers who leave out inconvenient facts or downplays facts that fail to conform to the ideal story they are looking for. Memoir though is somewhat different. He points out that there are some things he simply cannot remember. The honesty of fallibility of memory is essential to memoir, Strauss adds. Bailey says his mother’s comment was the one that meant the most afterward. He has a strained relationship with her, and the portrayal in the book is not kind. She of course realizes the person she was at thirty is not the same person as she is at seventy-five. But still, her portrait is not a pretty one. After reading the book though, she told Bailey he was too hard on himself in the narrative. That, for him was a kind of compliment. Ultimately, Bailey says that after writing the book, he’s “much more well disposed to my parents, to Scott.” He has not spoken to his father in nine years, but he has a better understanding after reflecting on their relationship.